I'm happy to tell you that although Sharon is not out of the woods yet, she's showing some signs of improvement. She's still in ICU, with all the bits and pieces attached to her, but it looks like she turned the corner. Her family was overwhelmed at the outpouring of support and love for Sharon here on the blog. You might have noticed that Sarah, her daughter, left us a note of thanks in with the comments. Sharon's husband, Claude, sent a couple of emails yesterday to keep me up to date with her progress and to thank you all for your prayers and good wishes. Please keep Sharon and her family in your thoughts during this period of recovery. Hanno and I kept ourselves busy during the past few days. I never understand when retirees say they're bored and there's nothing to do. We took a little trip in the car down to Ipswich, a city close to our State capital, last week. I have to tell you that road from Brisbane to Ipswich is very scary. It's narrow, curvy and has a lot of B double trucks speeding along. I was pleased we came home along the back road with little traffic and a lot of beautiful scenery. I sat there with my knitting as we ambled along, just gazing at the passing parade. Life moves slowly along the back roads, it's more to my pace. We passed through a little town called Toogoolawah on that backroad. It's typical of small Australian country towns now in that it had a pub, a grocery store, newsagent, garage and a few antique shops and not much else. But they did have an old movie theatre and in the great Australian style of Saturday night pictures, which we all used to call it, they showed The Prince of Persia and Marmaduke this Saturday night just gone. The Prince of Persia could easily have been an old film from the 1940s, starring Victor Mature or Van Johnson, but it was a new film, with people I'd never heard of. I'm sure everyone enjoyed it though - a treat for the whole family at the end of the week. We always look for road side stalls to buy those vegetables and fruit that we don't grow ourselves. Hanno found a little stall with reasonable pumpkins, and although their sign advertised Granny Smith apples for $2.99, he said they weren't worth buying. That turned out to be good for us because when he went to the farmers market yesterday, he found a fairly local grower with superb Delicious, Pink Lady and Granny Smith apples and they were $1.99/kilo. And, all picked in the last week. We shared a very big Delicious apple, one bigger than any I have seen for years. 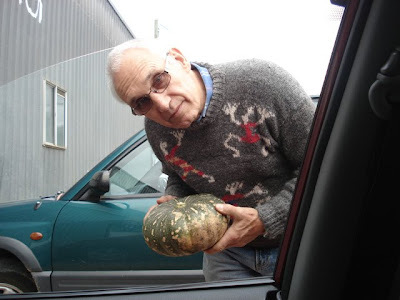 Hanno said the farmer told him he grows for Woolworths (a big grocery chain here) and they were too big for them. They all have to be a regulation size, so these beauties were rejected. I shouldn't complain, because we benefited from their short sightedness, but it's insane to pick fruit for size and not for flavour and freshness. When we came home, we closed the gate and settled back in together here, in our home, growing, sewing, making, relaxing, knitting and living the good life. I did some sweet baking to keep us going for our morning teas over the next week and last night I cooked curried prawns and rice for our dinner. Yesterday afternoon I made a fleece coat for Alice. I had some old fleece given to me by my DIL Cathy. She had a throw-out a year or so ago and asked if I wanted to look through it. I found a number of pieces that I've used for fund-raising aprons and bits and pieces here, and now Alice has a coat. Now that she's old, she's not covered by hair as much as she was in the past and she's lost weight in the past year. I'm sure she'll like wearing her coat at night while she sleeps. 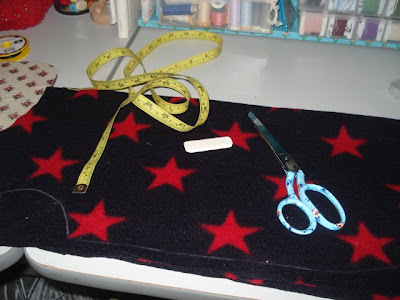 I used a doubled over piece of fleece, cut the fabric after I drew the pattern with tailor's chalk, and used old cotton tapes to keep it on her. It's simple but it looks like it keeps her warm, and I think I heard her whisper that she likes the stars. It will be another busy and productive week for us here. Hanno found some good rye flour at the shop last week so I'll be making rye bread today. Hopefully I'll have photos for you tomorrow. We have a lemon tree full of fruit waiting to be picked and juiced and Hanno has some seedlings to plant out. I am hoping to do a couple of hours knitting today as I want to finish Hanno's jumper off before it's too late this year to wear it. I've almost finished the front and just have the two sleeves to go. I hope you have an interesting and productive week too. If you have time, let me know what you're up to. I'm so glad to hear that Sharon is showing signs of improvement. She is much loved, I can tell!!! 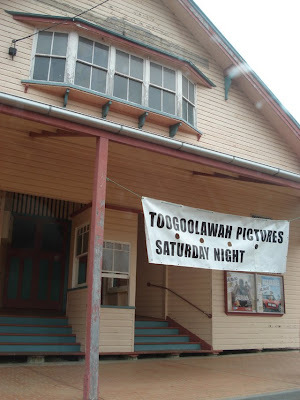 This was a GREAT post..I loved seeing the picture of lovely old theatre in Toogoolawah..I love old buildings...even the tired looking ones have such charm and beauty to them. I love hearing about your days. Hubby and I are eager for retirement, 'cause then we can do all the stuff we want to do, and not split our time between what we want and what we have to do. So glad to hear about Sharon turning the corner Rhonda, must be a great relief for all concerned. And Alice looks so gorgeous and proud in that little coat! well done you! Your weekend sounds lovely. I'm getting back into the rhythm of writing again - it's been on a back seat for the past month while I've got used to my new job. I got used to doing everything else first, and cramming the writing into the last couple of hours of the day. Not good. So pleased to hear of Sharon's improvement, my thoughts and love are with her and her family. I just love your dog Alice!! She is so beautiful. My son Andrew was given a soft toy a few years ago and it looks just like Alice (though he calls his "Wagger"), just wondered what breed Alice is? You asked what we are planning for the next week......well I have exactly one week to go before the annual summer holidays from school, so because I just know that I am not going to get a lot done the following 7 weeks, I am going to catch up with some of my outstanding jobs such as the ironing pile and cleaning the windows, and make a list of things to do and try to keep my 2 wonderful kids happy and entertained!! We are going to have a great summer with hopefully not too many "but I'm bored Mum" bits in between!! I'm so glad Sharon is doing some better, will continue to be on my prayer list. I, too, love to stop at roadside fruit and vegetable markets. You never know what you might find. Our county have restrictions which do not allow roadside vendors. Many nearby counties do allow and it brings those farmers' income and helps us have fresh food at reasonable prices. When we travel to the beach or the mountains we usually stop at a few along the way in each direction. Have a great week Rhonda Jean. I wonder if they're all related?? Morning Rhonda, from 'down the road'....Murwillumbah. It's always nice to think we're enjoying the same beautiful sunrise and cool crisp morning while waiting for the day as I read your latest blog entry. This week's a busy one for me, I head to the US on Sunday to visit my daughter and 4 g/children. So there's summer clothes to be found and washed, a last tidy of the pantry and fridge for the housesitter, seedlings to plant out, a new shed to be put up, sadly a pawpaw tree to be removed, as it's gone rotten and is leaning on the fence...it needs to go. I'm hoping to finish a couple of summer tops I'm making to take, visit a couple of loved ones, one very old and the great nana of my g/children...she will have some little trinkets for them all, one who's not been well, and fit in anything else I find a moment for. Once I get to the States, we're all heading off by car, well, mini-van to Canada for 10 days, so a greta adventure a great adventure ahead for me. Pleased to hear Sharon is doing better, we 'talked' a few times when she was organising swaps...be well, Sharon. Have a great week Rhonda. Whenever we visit hubby's parents I always request that we go the 'back' way. So much nicer than the motorway. What a great cinema, sounds like a lovely town. We had a day of visiting friends then pottering in the garden. All my veggies are in pots and it's been so warm and dry here that they have been suffering a little. I have been emptying the bathtub with a bucket so that I can reuse the water for everything. Glad to hear that Sharon is a little better. Heather, great news on the soap. May it be the first of many batches. Jenni, I have found the writing needs to come first too. All else will fall in behind it. I hope you're happy with your words. Shelia, Alice is an Airedale Terrier. She is the most gorgeous dog with a lovely temperament. Airedales are just wonderful with children, they're playful but very protective of their family. I think they're the perfect family dog. Nanette, I have been doing some research on Murvillumbah. Do you know of a good website that tells its history and what is there now? Bon voyage. I hope you have a wonderful trip. Tilly, the back way is usually better, and not just on the roads. I hope your vegies survive the heat. Really glad to hear that Sharon has turned the corner. Prayers are still coming her way until she is back to a full recovery. I just love seeing the pictures and the tour of the town. 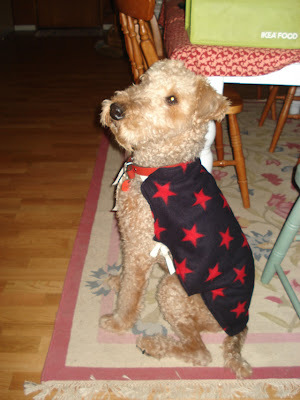 I just love the little jacket you made for the puppy too :) Great post!! So glad to hear Sharon is holding her own. Prayers continue for her and her family. I love road trips on little traveled roads. I have gotten to the age where I don't have time to be in a hurry. I am getting ready for a camping trip next weekend. We, friends and I, don't go too far from home, but fortunately living in this part of Oregon, we can go a few miles and be away from it all. My regular chores are interspersed with the camping chores, so not much extra is happening at the moment. So glad to hear that Sharon is doing better. How scary and trying for her family. I loved your descriptions of a day in your life today. How calm and relaxing. The town you went through sounds just lovely. (as your whole day altogether) Thanks for sharing your day with us! I loved Alice's coat! I would like to make something like that for my Mom's dog. PS: Alice's coat is beautiful! In the picture where she is sitting, she looks as if she is wearing a cape...Super Alice! Glad to hear Sharon is doing a bit better. Love the new coat for Alice :) So cute! Rhonda, us locals aren't too fond of the road to Ipswich either (assuming you came in the Ipswich MWY that is?) but, believe it or not, it's improved considerably! lol You should've popped in for a cuppa break, I'm not far off the road! I LOVE a drive out on the back roads... the scenery is just gorgeous. 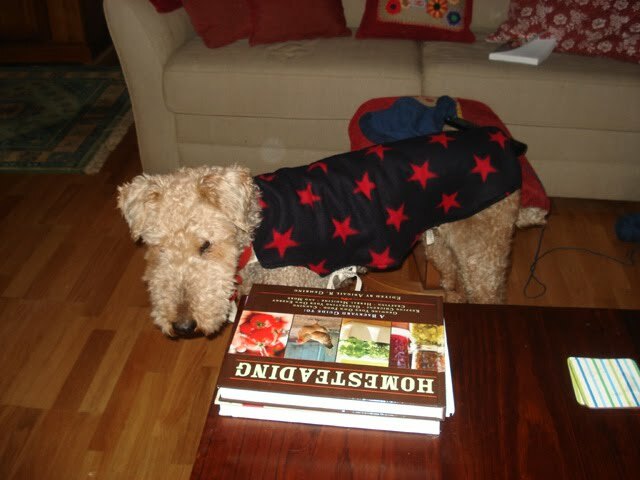 Rhonda the coat for your doggy is such a good idea and as usual your scones look so good. I am working on finishing up Christmas gifts this week and hopefully get a head start on birthday gifts before I head back to work next month.Thank you for sharing your ideas, you are such an inspiration. this week I'm removing nails and staples from my hallway floorboards as I've just ripped up the old carpet. It's surprisingly satisfying work! I also need to make more washing powder to last the next school term, and run up a curtain for the dining room. 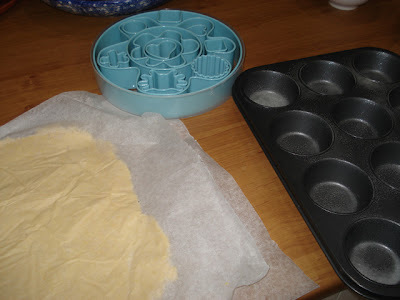 I'm also baking lots as the kids are having friends over for school holidays. Some pruning needs to be done too! I'm off work this week so should get most of this done. We have just stepped off the treadmill and will be schooling and working from home from next week. This does entail a bit of financial sacrifice but I know we can do it. Very excited about getting our life back and taking control of our precious time again. Rhonda, thanks for the continuing inspiration and the wonderful energy you put into your blog. It helps to empower people to make life changes like the one I'm undertaking. Some time I'd like to do a guest blog on transitioning to being a single parent -I'm sure lots of readers would find it helpful. Alice looks so handsome in her new coat! Glad to hear Sharon is on the mend. Here's hoping she continues to improve. Glad to hear Sharon is improving. Will continue to keep her in my prayers. Love the sweater for you dog. So adorable. Have a great week! I didn't realise you were so close to me. I live in Brisbane and have my parents living near Boonah and my partners parents living at Pomona, you would most probably know both of those places. When we move to our 'homestead' in a few years we will be looking at areas in the Noosa hinterland like Kilcoy, Pomona, Cooroy, Maleny, etc so we will really be neighbours then. It really is beautfiul scenery up that way. Thanks for a great post, that had me reminiscing about growing up in a small country town like Toogoolawah. I LOVE that tea cozy! It's soooo cute! This whole seconds thing is baffling really! I bought half a ton of seconds carrots for our pigs for $25, there is nothing wrong with the majority of them! Glad to hear Sharon is slowly recovering. All good wishes to her and her family. I'm farm sitting for some friends this week....cows, horses, dogs, kittens, chickens, ducks and geese, Plus my own dog, so busy busy. Also the veg plot to kep an eye on. I'm a little frightened of the geese, but the rest are fine!! Alice looks so cute and bright in her coat! 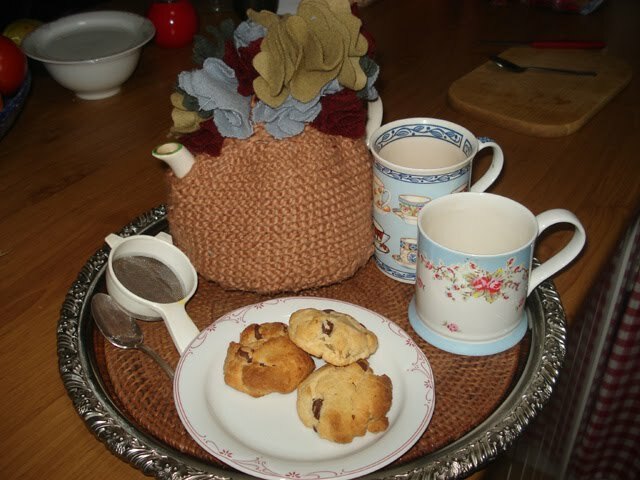 This week I am recuperating from knee surgery - it is going well and this small period of reflection is helping me with ideas on streamlining my schedule when I am back up again. I also purged a lot of things in my bedroom, with my daughter's help. That coat is very cute!